This week’s assignment for physical computing was to design a physical interface for an imaginary “fantasy” device that we’ve always wanted. The device that I’ve mocked up here is a climate controlled jacket. This idea has actually crossed my mind a number of times. Practical issues aside, it would be a nice thing to have. Imagine walking around in the middle of summer, getting strange looks as people wonder why you’re wearing a heavy jacket at this time of year. Little do they know that you have a portable air conditioning system in there. The idea is that there would be an option to turn on heat in the winter and cold in the summer. The diagram above showing that you turn either one of the knobs on and continue further on to the right to increase the strength of each. I tried to keep the controls as simple as possible, yet as I was making this decision, I decided to take a look at the interface on the air conditioning system we have in my apartment. It was rather amusing to think of how some of these controls would port over to the jacket interface. 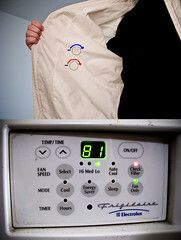 Most notably, how would “Energy Saver” or “Sleep” change the way the jacket functions. Leaving me to think, how does the context of use change one’s perspective on simplicity versus complexity? I decided that I had made the right decision. This week in class I was working with Corrie on a particle emitter. Learned some fun new things from her in the process. The sketch emits particles at the mouse coordinates and toggles on and off gravity with a mouse click. You can see it in action below or check out the sketch to play around with. As an assignment for our first week of physical computing, we were asked to take a walk around our neighbourhood taking photos of sensors that we come across. As I am still new to the neighbourhood here, I was also happy to take the time to explore some areas I have yet had the chance to. According to Wikipedia, “a sensor is a device that measures a physical quantity and converts it into a signal which can be read by an observer or by an instrument“. These devices serve a diverse range of purposes, from simple to complex or reactive to interactive. Many of them manage to blur these boundaries without notice as they have integrated into our daily lives in such a ubiquitous fashion. Have put up my assignment for the first week of Introduction to Computational Media. Had to draw something in processing as an introduction to some of the basic drawing tools. 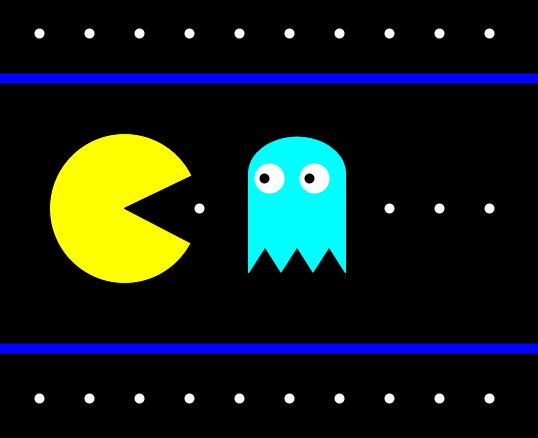 I chose to do a mockup of PacMan. Here is the processing sketch to take a look.